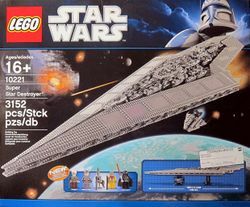 10221 UCS Super Star Destroyer is a classic Star Wars Ultimate Collector's Series set released on September 1, 2011. It contains 3152 pieces. 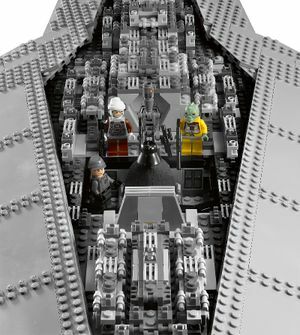 The set also includes a mini-scale Imperial Star Destroyer made to scale in comparison to the Super Star Destroyer. It was designed by Kurt Kristiansen. Bossk makes his second appearance to date but his variation remains identical to the one from 8097 Slave I released in 2010. Dengar makes his second appearance to date with his first being in 6209 Slave I. Dengar has been re-designed with extra detail. Admiral Piett makes his first and only appearance in this set featuring the same face used for Professor Snape in the 2010 Harry Potter sets. Darth Vader appears in his latest variation for the second time with his first being in 10212 Imperial Shuttle. This variation of Darth Vader features a cartoon like face featuring white pupils and added detail. The Executor, (the name of this ship in the Star Wars saga, and also the name of the model) was Darth Vader's personal flagship, notably serving in the battle of Hoth, and the subsequent asteroid chase with the Millenium Falcon. The battle over Endor saw the destruction of the massive 19 km ship when Arvel Crynyd, Green Leader rammed it as a last-ditch effort. The Super Star Destroyer plummeted into the unfinished Death Star causing enormous damage and killing most of the Galactic Empire's best officers. This is the longest Star Wars set in measurement to date. Admiral Piett and Dengar (Variant Two) are exclusive to this set. This is a description taken from LEGO.com. Please do not modify it. (visit this item's product page) Dare to pilot Darth Vader’s™ deadly destroyer! Facts about "10221 Super Star Destroyer"